HIGH drama in Parnell Park as Dublin absorbed the concession of four Waterford goals and a 78th minute penalty to win their Division 1B by two points. Stephen Bennett, who combined superbly with his brother Shane all afternoon, had his shot saved by Alan Nolan when a goal would have given Waterford a victory they scarcely deserved. Having slumped to a disappointing loss in Salthill last week, the victory seemed more important to Dublin than the tangible reward. Dublin finished first half in the distinctly weird position of being two points up but hugely frustrated with that position. Mostly, that’s because the three goals Waterford scored in the first 26 minutes could be easily filed under the ‘soft’ category. After just four minutes, a poorly-struck Stephen Bennett free of 65 metres appeared to be falling harmlessly into Alan Nolan’s hand only for the Dublin goalkeeper to inexplicably spill the ball into his net. Fourteen minutes later, a sideline from Jamie Barron from his own ’45 cleared everybody in a condensed middle third, dropping awkwardly behind Darragh O’Connell and Seán Moran into the stride of Tommy Ryan. Ryan galloped through and managed to squeeze a shot past Nolan. Then with ten minutes left in the half, Stephen Bennett managed to turn Eoghan O’Donnell and with Dublin bereft of cover, squared to his brother Shane, who had the luxury of time to place Waterford’s third goal inside Nolan’s left hand post. But that was mostly it for positive Waterford attack play in the half. By contrast, Dublin’s play was much more creative and they scored 0-14 of 19 attacks. Eamonn Dillon threatened to break loose on goal a couple of times but 0-3 was a decent return for his energy. Danny Sutcliffe, who dropped deep from centre-forward to exploit Austin Gleeson’s reluctance to vacate the central channel of the Waterford defence, matched him for output. Dublin had seven scorers in the half against Waterford’s three. With the benefit of a slight breeze in the second half, that dynamic changed. Jamie Barron become a force in the game. Waterford exerted more control around the middle. But mostly, the Bennetts weaved patterns of intelligent attacking play. Rushe scored Dublin’s goal after 43 minutes after he and Sutcliffe had conspired to dispossess Barron. Sutcliffe fed Rushe, who buried from close range. Waterford inched their way back into it though and again, the Bennetts combined for their fourth goal, the score that ensured the final 10 minutes were a frantic scramble for the lead. 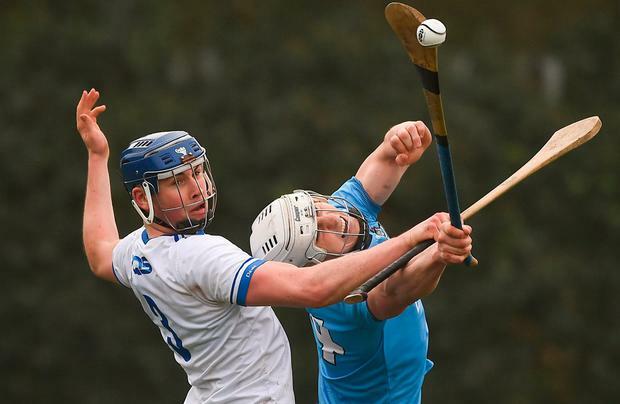 Kevin Moran put Waterford a point up on 68 minutes but with Sutcliffe prominent, the Deise gave up a couple of easy free for Oisín O’Rorke to convert. With Dublin two points up in the 77th minute, a long ball from Gleeson dropped towards the square wherein Tommy Ryan and O’Connell were engaged in a wrestling match. Fergal Horgan adjudged O’Connell the aggressor and awarded a penalty. Stephen Bennett stepped up but Nolan made up for his earlier mistake and Dublin claimed the points. SCORERS – Dublin: O O’Rorke (9f), L Rushe 1-2, E Dillon, D Sutcliffe 0-4 each, J Hetherton, C Crummey 0-2 each, S Barrett, F Whitely 0-1 each. Waterford: 2-7 (1-7f), Shane Bennett 1-2, T Ryan 1-1, K Moran, J Moran 0-2 each, J Prendergast 0-1.